Transcendence is at heart an old-fashioned monster movie. Unfortunately, it doesn’t seem to know it. Ostensibly a cautionary tale about the prospect of the Singularity – the idea that human consciousness and technology will one day inevitably merge to create a superior form of life — Wally Pfister’s film tries to blend action epic, intimate drama, and scientific thriller all into one. But it’s really a film like The Fly or Colossus of New York, in which scientists flaunt the rules of nature and wind up turning themselves (or their loved ones) into horrific, awesome beasts, always with tragic results. Here, the scientist in question is brilliant artificial-intelligence researcher Will Caster (Johnny Depp), who has been shot by a Luddite terrorist using a radiation-tipped bullet. (“You want to create a new god! Your own god!” his assassin yells at him.) Will’s wife Evelyn (Rebecca Hall) has the brilliant idea of uploading him into an existing artificial-intelligence system, as a way of both keeping his mind alive and solving a technological problem. You see, the big hump in AI research is how to explain conscience and consciousness to a machine, however smart it may be. But by using an existing mind — Will’s — they render the question moot. Man and machine will merge, not supplant each other. Or so our heroes think. The upload is a success, and soon enough, Will, who was a modest, rumpled academic type in real life, wants to expand and access financial networks and other sorts of databases. (I think he actually utters the words, “I need more power!”) “Fifteen minutes after he logs on, he wants to plug into Wall Street?” asks fellow scientist Max Waters (Paul Bettany). “That’s not Will!” The question of to whom this new consciousness belongs — is it Will, or is it something else? — is one the film asks multiple times, tantalizingly, but it never quite settles on an answer. Or rather, it settles on an unsatisfying one that has more to do with hastily assembled third-act resolutions than with anything suggested in the narrative. Meanwhile, the aforementioned Luddite terrorists are hot on Will’s trail, as are the Feds. So, our new cyberprotagonist instructs Evelyn to go “off the grid” (what?) and directs her to a desolate town in the middle of the desert called Brightwood. With a bank account newly flush with Will’s artificially intelligent high-frequency trading gains, Evelyn buys the whole town and builds a giant new center where Will can expand the possibilities of what he can do — which involves curing the sick and dying, manipulating the weather, and turning the down-and-out residents of the town into a kind of robot-zombie army. Science! Transcendence wants to raise real questions about scientific hubris, about the notion that science is always trying to perfect the world. Late in the film, Max looks at the chaos around him and declares, bitterly, that it’s “the end of a more primitive, organic form of life and the dawn of a new, advanced age.” He doesn’t mean this in a good way. 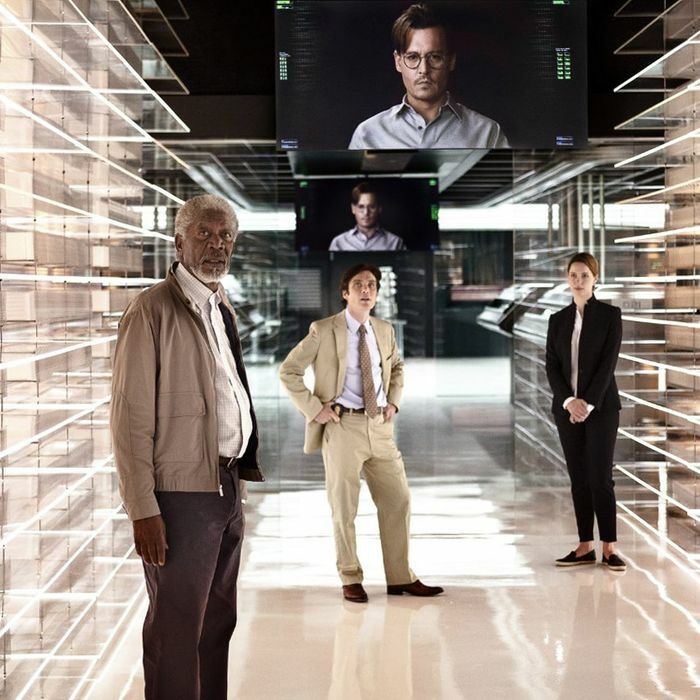 But everything with Will’s new cyberidentity goes so wrong so quickly, and in such a far-fetched manner, that the film’s more philosophical aims come off as contrived; it doesn’t earn its dystopia. What does work in Transcendence, however, is the human tragedy at the heart of Will and Evelyn’s relationship. Hall does loss well: We’re with her heartbreak at the impending death of her husband, and when he finally responds from the other end of the digital-human divide, we breathe the same sigh of relief. What makes the actress’s performance all the more remarkable is that Depp essentially Skypes his performance in. One wonders how the film’s emotional valence might have changed had someone who could evoke our sympathy been cast as Will. Transcendence is an ambitious film. Director Wally Pfister has served as Christopher Nolan’s cinematographer on numerous features, and he clearly wants to mimic Nolan’s successful fusing of pop and philosophy, of breakneck action and high-minded portent. But he lacks Nolan’s shorthand, the ability to convey complicated narrative concepts in speedy fashion, which is the secret building-block of the director’s dense narratives. As a result, Transcendence never quite succeeds at telling a story of scientific overreach. And it doesn’t really click as an action movie either. But as a human tragedy of man and monster, of beauty and beast, it has just enough genuine pathos that you wish it were better.